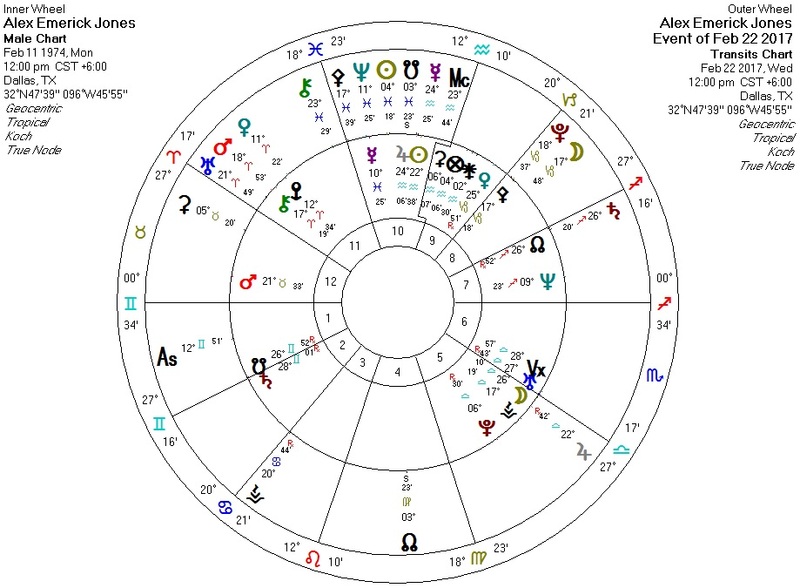 This is Alex Jones' chart (birth time unknown) on the day of the announcement linked above. Transiting Pluto conjunct Jones' Pallas and square Jones' Chiron: overwhelming force triggering injury (Chiron) and a crisis of decision (Pallas). This is triggered by transiting Mars conjunct Jones' Chiron and square Jones' Pallas and transiting Pluto. Transiting Saturn conjunct Jones' North Node in Sagittarius: Jones' destiny as a public firebrand stifled.